In a dystopian future, Thomas the assassin is about to face the job of his career -- and his life. After avenging his alcoholic father's untimely death, Thomas begins his transformation into a cold-blooded killer. 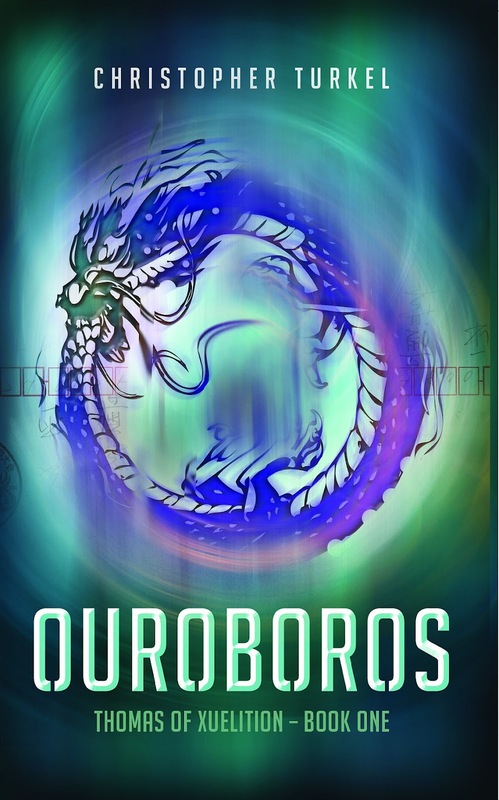 The Prakanis, a human race with superhuman abilities -- and superhuman egos -- rules the land of Xuelition with an iron fist, and as Thomas learns, it's much easier to work with than against them. When the government hires him to recover bonds from a disgruntled employee, Thomas has no idea what's in store for him. He's stealthy, clever, and one of the best assassins in the business, but what he learns on this mission will change his life forever. Like many good things, this book starts in a bar. “What are these many things?” I hear you ask. (don’t look behind you, lemme tuck my feet under the curtains first!) Bar brawls, flirting, drunkenness, a tall tales competition, or in this case – hiring an assassin. 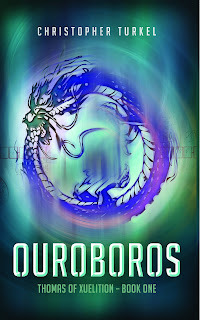 Ouroboros is the story of Thomas of South Xuelition. We follow Thomas as he is hired to take out a Prakani, who happen to be well-rounded, snotty pricks. Turkel did a good job of making me dislike them and have fun mocking them, (it is always a plus to have a good solid group of people you can point to and mock.) and then he completed the job by making me kinda like them. (Some of them, anyway.) Snotty and full of themselves they most certainly are, but there are some nice ones in the bunch. The story took a bit for me to get into it. I think it mainly had to do with this being my first book read with the main purpose of reviewing it. There’s a good flow worked into the telling of the back story. We find out why Thomas became an assassin – while the story moves him along his mission – without really slowing down or hindering either story path. I liked that. Another good thing is the descriptions. They were enough to flesh out the story and allow me to build the surroundings in my head, without getting into the age of the wood, the direction of the grain, the back story of the carpenter, which wooden floor panels creak, whether there are termites or not… Gah! May the gods save me of such filler! (No filler here.) Things, people and places are described enough so you are not imagining an amorphous blob of ectoplasm, and then we get on with the story. Me likey. Note: I’m halfway into the book now, and I forced myself to write my thoughts down before my aging brain misplaced the files. I say forced, because I’m getting into it now. We left Xuelition and are now in Crypttown. We found our mark. Thomas and I, plucky witty sidekick that I am, shall go and hunt that snotty Prakani down. I’ll report back after the second half of the book is read, and I have a better idea of what it’s all about. Ok. As soon as I finished writing the first half of the review, and I jumped back into the book, a wild plot twist appeared! Half way in and I didn’t see the twist coming. Maybe I should have, but I didn’t. Which shows I’m slow, or that I managed to stop overanalyzing and just go with the story. I vote for option two since it’s better for my image. I liked the book. I liked Thomas, liked/disliked the Prakani, liked the story and the twists. I would have liked a bit more action. Not enough assassinations for a story about an assassin. Wizardry (magic only humans are able to use) and abjuration (magic only the Prakani are able to use) are mentioned, but not enough development there. I’m a sucker for actions scenes and magic, so the lack of both disappointed me a bit. That said, I enjoyed the read. I finished the book both eager to find out how it would end and sad because it was ending. Reading and reviewing was a great experience for me. I hope the next book I review is as enjoyable as this read was. I’m looking forward to meeting up with Thomas in the second book and finding out where Mr. Turkel will take us next. Thomas is moving up in the world, and I want to go along for the ride. Be sure to add it to your TBR list on Goodreads! To satisfy FTC guidelines, I am disclosing that I received the book for free from the publisher or author in exchange for an unbiased review. It has in no way affected the outcome. All expressed opinions are awesome, honest, and courtesy of me. ♦This is the first book I read with the express purpose of reviewing it. It’s been fun, but at the same time, I didn’t read it the way I usually read. I was no longer reading something simply for the enjoyment of a good story well told. I started paying attention to story cohesion, flow, grammar, continuity, things that make no sense, etc. It got to be very annoying, as it got in the way of simply reading.